A group of individuals in the city are taking self-defence classes to girls in orphanages, keeping them in good stead for the future. Sometimes, it takes a simple step right at the grassroots to bring about a solid change in a societal construct. And, in the current climate of never-ending debate about women’s safety and what can be done to prevent crimes against them, one individual decided to take matters in his hands. Raghu Veer Reddy started the ‘Yodha’ movement centred around three principles — anyone can be a warrior or a Yodha, whether it’s a man or a woman, teach men about respecting women and spread awareness among the populace. “Our goal is to ensure young girls grow up strongest and become capable of protecting themselves in their life. Such self-defence classes are even more important now, as we read about crimes against women on a daily basis,” explains Raghu Veer who started the initiative under Joy of Sharing Society, an NGO which covers a wide gamut of issues. The Yodha movement was started six months ago, where the team first reached out to orphanages in the city and explained the concept to them. “We teach the girls various strategies to defend themselves through martial arts. Using taekwondo, we show them basic hand movements like how to throw punches, blocking a blow, and a combination of kicks,” says Raghu who is supported in his efforts by teammates Nag and Kishore. 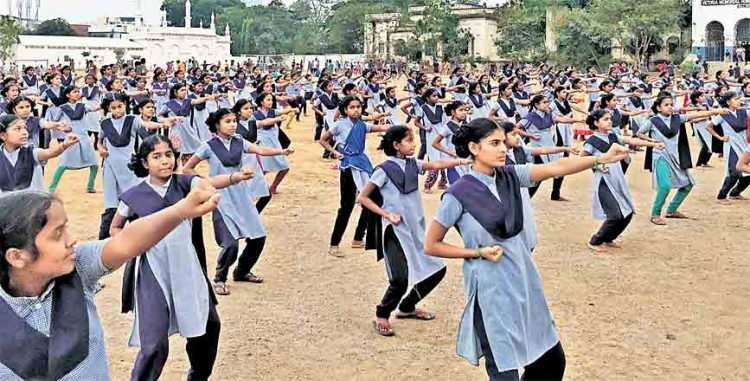 So far, they have trained 400 girls in self-defence in four orphanages across the city. The classes are free of cost and taught by professionals trained in taekwondo. “Every week, we conduct 3 to 4 classes for 90 minutes for a period of four months. The team comprises students and professionals who take time out from their schedules for the initiative,” adds Raghu Veer. Their efforts to equip the girls with skills that will keep them in good stead for life reflect in the medal tally of championships. “Some of the students who trained under the initiative also won four gold, two silver and one bronze medal at the district-level competition organised by the Hyderabad District School Games Federation recently. Out of the seven girls who participated, three have been selected for the State-level competition,” says Raghu who is presently working in a startup and divides his time during the weekend for his volunteering duties. With the self-defence classes coming to an end in some time and new batches in the pipeline, Raghu Veer and his team are busy putting together an event where the students can display their skill in martial arts. “I hope one day this movement is not only limited to Telangana, but will spread across the country,” adds Raghu.